If you are the sort of motorcycle mechanic who does your own work because you know you can do a better job than most local shops, the uView 550000 is for you. One of the best reasons to live in Phoenix if you are a Goldwing owner is Stu Oltman. He’s the senior technical editor for Wing World Magazine, the Gold Wing Road Riders Association’s monthly publication. The more difficult and harder a problem is to solve, the more he seems to enjoy it. He’s also a great source for new product ideas – especially ones involving the repair and maintenance of motorcycles. 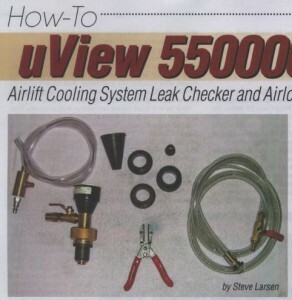 I saw him demonstrate the uView 550000 at one of his famous “Garage Days at Stu’s” and so I ordered one. When it came in I took it over to Stu’s garage to make sure I did everything right. That also left my hands free to make notes and take some photo’s. This review is the result.